We had a surprise visitor today. It was Dr. Marc Mitchell, Founder and President of D-International, and Lecturer on Global Health at Harvard University School of Public Health. He is a pediatrician and management specialist by training and has worked in over 40 countries in Asia, Africa and Latin America on the design and delivery of health care services. His current work focuses on the use of electronic clinical protocols running on mobile phones to enhance the quality and continuity of care in low income countries. His work is a perfect example of how to marry simple modern technology with health care service. His organization, D-tree International has been adapting and replicating this work in different developing countries with very positive results. The innovative interventions his organisation has introduced in some of the developing countries has brought about notable improvements in the health sector indicators. Listening to his experiences we were convinced that some of these innovative interventions can be effectively adapted in many states in India, especially those that pertain to better anti-natal care, prevention of water-borne and vector-borne diseases and reducing IMR and MMR. He also gave interesting illustrations on how technology can be engaged for improving administrative accountability. According to Dr Mitchell, the US has been the hub for innovations until now. With its centres of higher learning, emphasis on research and value placed on creative thinking, the US has had the perfect eco-system for innovations. Interestingly, Dr Mitchell believes that in future years this position will be taken over by India. The socio-cultural and political diversity of the states, the varied schools of thought and the large young population place India in the fore-front of innovative thinking and practices. But, he added, that is possible only if the people with the right temperament pursue and lead these activities. 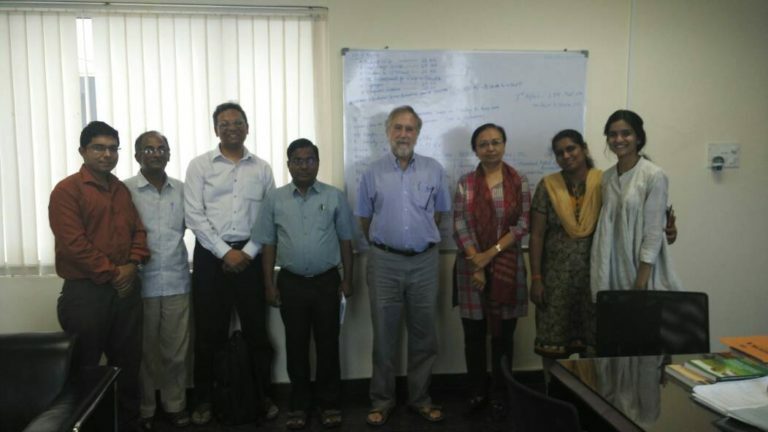 Dr Mitchell shared with us his take on how to make CIPS a centre buzzing with innovative ideas and throbbing with activities on how to spread the impact of innovations in public systems into the furthest corners of the country. Pointing to our clutch of bright young project staff he commented how CIPS is the perfect place for change-makers. His visit left the team enthused, energised, and perhaps a little dizzy-headed too. You can expect to read more on our website on how to take the above ideas forward.